I am old. Not that old. But I am old enough. I am in my early 30s and I am still waiting for the day when I become an adult. Mostly because I believe, mostly because I know that the decisions I make are not “adult-like”. I have been told that several times and I am aware. I don’t need to be told. I don’t need to be nagged by almost everyone around me. It isn’t fair. And yet life is not that bad either. Life is passing by and everything else with it. These are the times when you need someone like Sarah Andersen to tell you that life is okay, you are okay the way you are, and even if it isn’t okay, then it is alright. “Adulthood is a Myth” is a collection of Sarah Andersen’s rad comic strips – which are funny mostly, depicts the times we live in – the dating scene, the lonely ones, technology and everything else rolled in between. Above all, it speaks of how okay it is to not grow-up in a world where everyone just wants to prove something or the other. This book is perfect for everyone and hence makes a great gift! It will resonate with almost everyone who has had a tough patch or the other or for who even waking up on a Monday morning to get to work is tough. The situations are from life, the embarrassments are real, and the annoyances of life are just too vivid and we have all been there, done that. The book makes you feel that you aren’t the only one who feels and thinks that way. There are perhaps millions of people who feel the same but never communicate it, till Sarah has. Read her comics online and most certainly pick up this book! This entry was posted in 2016, Andrews McMeel Publishing, Books, Comic Strips, Comics, humour, May 2016 Reads, Simon and Schuster and tagged Adulthood is a Myth, Andrews McMeel Publishing, Comic Strips, comics, Contemporary Women, humour, Sarah Andersen, Sarah Scribbles, satire on May 13, 2016 by thehungryreader. 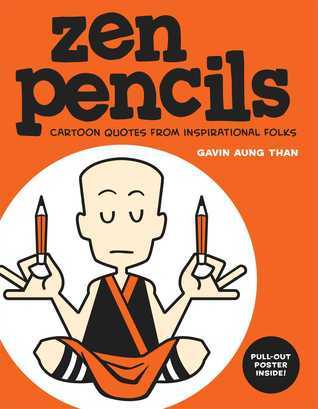 If you have to read a self-help book this year, that is not condescending at all, but only helps you move on page by page, then you have to read “Zen Pencils”. It is a book made after the very famous website created by Gavin Aung Than and there are these cartoons there along with many more. I bumped on to the site after reading the book and could not have been happier than this. There is something so reassuring about reading these snippets of self-help and motivation. 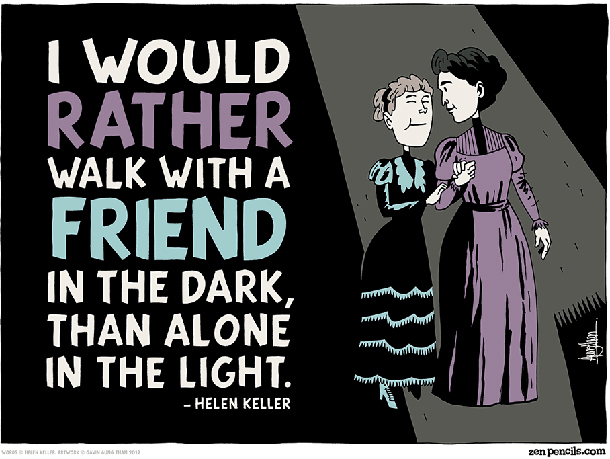 Maybe that is what is needed in times such as these, which is ridden with cynicism and utter hopelessness. The anecdotes and quotes are from famous people – from Neil Gaiman to a Tibetan monk to Henry David Thoreau to Confucius, their words are heart-warming, sobering and mostly just there to shake your existence. “Zen Pencils” makes you realize that perhaps it is not all that bad and that there is so much hope still for all of us on this world. These quotes otherwise maybe scoffed on and probably ridiculed as well, however when combined with some fantastic art-work, it is literally work of genius. One can relate to it and also think of applying what can be to life. 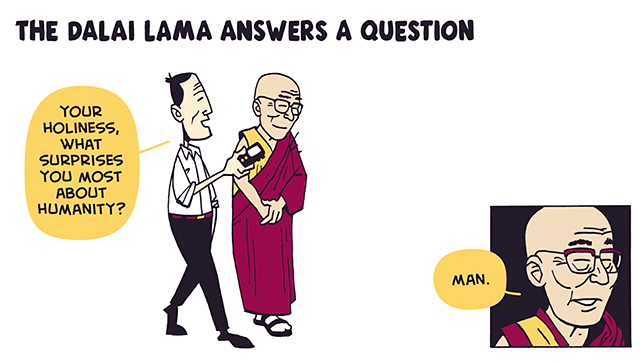 “Zen Pencils” is a definite read for almost everyone if you ask me. The graphics and the cartoons are simply charming and the book will surprise you for sure – more so when you sense that you are crying and if any book can make you do that, more so a book in a graphic format, then it is worth your time. I will reread this book perhaps multiple times and cherish it as much. Gavin’s work has enabled more people to think beyond and look at life differently. This entry was posted in Andrews McMeel Publishing, Books, Comic Strips, Comics, Non-Fiction, Review, Simon and Schuster and tagged Andrews McMeel Publishing, Cartoonist, Confucius, Gavin Aung Than, Graphic Artist, Henry David Thoreau, Marie Curie, Motivation, Neil deGrasse Tyson, neil gaiman, Non-fiction, Self-Help, Simon and Schuster, Theodore Roosevelt, Zen Pencils on March 10, 2015 by thehungryreader.